While on vacation with my family last week in Long Beach, Washington, we visited a few locations celebrating the area’s history. As fond as I am of things of bygone eras, we stopped at museums, historical sites, homes open for tours by various historical societies and the like. During an outings, I found a clothes wringer on display, proudly proclaiming its use in 1876. The labor-saving machinery is the mostly metal item on the bottom half of the image (above), bearing (upside down) “Lovell Mfg. Co.” and “Bicycle”, “Ball Bearing” and apparently a patent number. Two wooden rollers operate with a hand crank, and the tension is managed by a metal spring, saving significant effort in ringing excessive water out of freshly rinsed clothing. Given my two most recent posts on 19th Century Washing Machines (where I mention manglers, rollers, and more) and Warsh: Grandma’s Receet (Washing/Laundry, Granny’s Recipe), I found myself quite interested in this device. Given the setup of this curious museum (see the following paragraphs), I had to snap a picture and enlarge it, in order to read the print on the wooden contraption, above. Surely it isn’t a laundry water extraction device…but what is it? 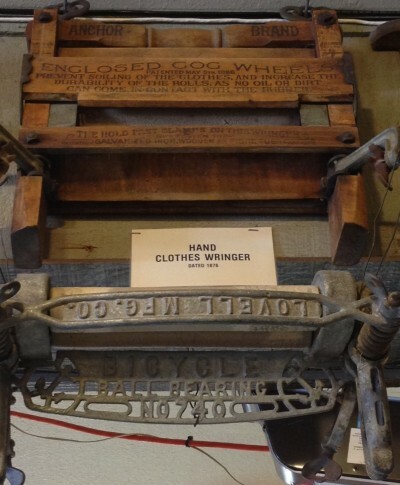 The print on that wooden device reads: “ANCHOR BRAND, ENCLOSED COG WHEEL, Patented May 5th, 1896, Prevent soiling of the clothes, and increase the durability of the rolls as no oil or dirt can come in contact with the rubber.” On the lower ‘rung’, “The hold fast clamps on this wringer will fasten to galvanized iron, wooden, and fibre tubs.” Sure enough, I see the clamps, but have NO idea how such a contraption was used. I’m certain my great-grandmother would either A) be most disappointed in me, or B) laugh until her ‘laugher’ broke. It took looking things up with a Google search, but sure enough, that wooden thingie is also a ‘hand-(operated) clothes wringer’. 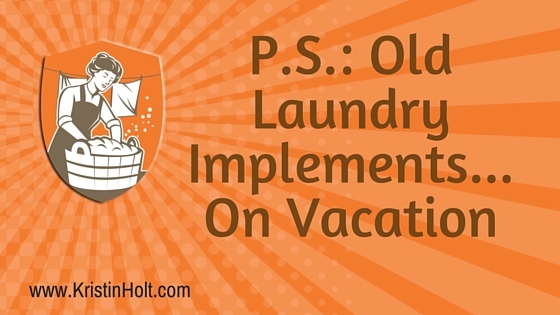 Things have certainly changed in the process of laundering clothing. 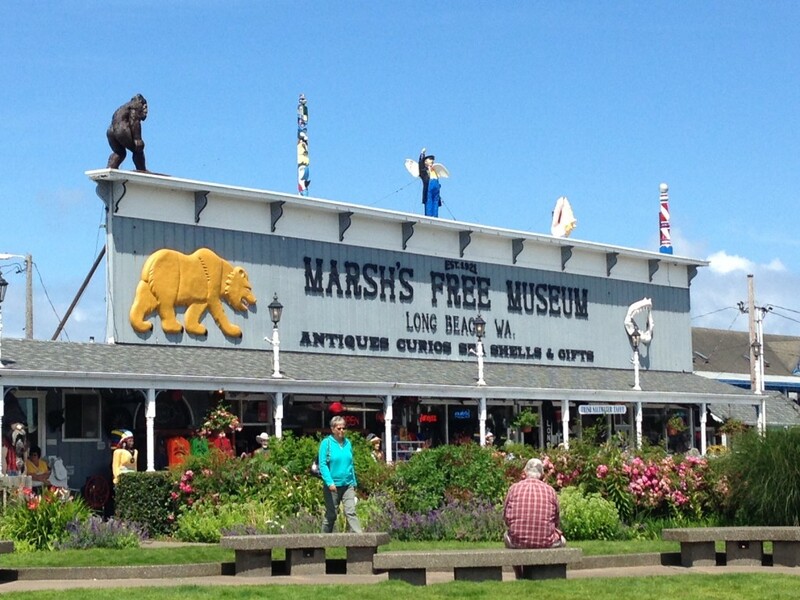 If you’re ever in the general area of this Long Beach Peninsula, stop by Marsh’s Free Museum, Established 1921 (as posted on storefront) or 1935 (as posted on their website), keep your eyes on the ceilings, rafters, and generally above-the-shelves walls, and see if you can’t spot these fabulous specimens of laundry of yesteryear. One more prize specimen spotted during this museum foray. (Ignore the Ladies’ Circle Comb.) 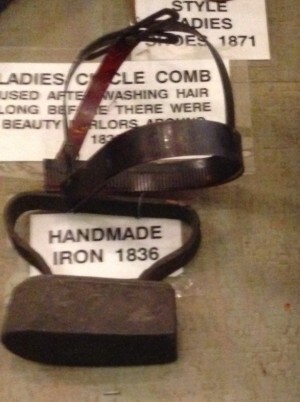 Take a peek at the Handmade Iron, circa 1836. Someone forged that iron out of… iron… (a blacksmith?) and heated it on a wood burning stove top on ironing day. Well-to-do housekeepers had two: one to use and one to reheat. Note the lack of a heat-proof handle. The user would likely need something to protect her hand (did they have pot holders then?). I just can’t see an apron providing adequate heat protection.